Being taught by a great teacher is one of the great privileges of life. Teach Now! is an exciting new series that opens up the secrets of great teachers and, step-by-step, helps trainees to build the skills and confidence they need to become first-rate classroom practitioners. Written by a highly-skilled practitioner, this practical, classroom-focused guide contains all the support you need to become a great modern foreign languages teacher. Combining a grounded, modern rationale for learning and teaching with highly practical training approaches, the book guides you through all the different aspects of MFL teaching offering clear, straightforward advice on classroom practice, lesson planning and working in schools. Teaching and learning, planning, assessment and behaviour management are all covered in detail, with a host of carefully chosen examples used to demonstrate good practice. 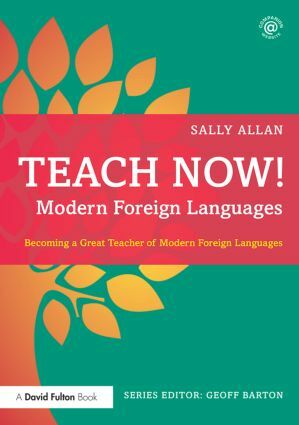 There are also chapters on the essentials of the MFL curriculum, pedagogical techniques, strategies to engage students in language learning, and how to succeed in observations and interviews. Throughout the book, there is a great selection of ready-to-use activities, approaches and techniques which will help put you on the fast track to success in the classroom. Covering everything you need to know, this book is your essential guide as you start your exciting and rewarding career as an outstanding MFL teacher. Sally Allan is Assistant Head Teacher with responsibility for student achievement at Forest Hall School, Stansted Mountfitchet, UK. Being taught by a great teacher is one of the great privileges of life. Teach Now! opens up the secrets of great teachers and, step-by-step, helps trainee teachers to build the skills and confidence to become first-rate classroom practitioners. The series comprises a core text that explores what every teacher needs to know about essential issues such as learning, pedagogy, assessment and behaviour management and subject specific books that guide the reader through the key components and challenges in teaching individual subjects. Written by expert practitioners, the books in this series combine an underpinning philosophy of teaching and learning alongside ready-to-use activities, strategies and techniques to ensure success in the classroom.